Wedding > Inspiration > Public Weddings, So You Want to Be a Star? Public Weddings, So You Want to Be a Star? Singer Robyn Monks and L.A. comedian Adam Gropman were happily engaged and happily pregnant when Adam saw the casting call from a friend. The call was looking for couples willing to be married on T.V., no other details provided. A few weeks later the couple found themselves at the Grammy Awards standing next to 32 other couples and a few rows away from Sir Paul McCartney. They were pronounced married by Dana Owens, aka Queen Latifah while Macklemore, Madonna, and Ryan Lewis sang in the background. Robyn, a singer who always promised she would be on the Grammys one day, believes she and Adam were chosen because they were the only obviously pregnant couple at the casting call. The couple has few regrets. "It was fun and exciting and I'm frugal," Robyn says. "Trying to have a wedding and a baby in the same year is insane, this was great." Robyn and Adam's one partial regret is that they did not have a chance to stand up and recite their vows and truly express themselves at their wedding. This is particularly ironic since Adam owns a company called, The Funny Biz, which specializes in creating speeches and toasts for weddings and other events. Wedding planner Sandy Malone is host of TLC's show, Wedding Island. Malone agrees that having such a public wedding can be a great thing, and says that few people who appear on her show have regrets. "Having your beautiful wedding day broadcast to millions of people all over the world is a pretty amazing thing – most brides and grooms have fun with it, " says Malone. She does however caution couples considering appearing on reality TV with their wedding to remember that while there may be monetary compensation for your wedding, you may lose time during your wedding. Reality shows can't put together a story line without interviewing brides and grooms and this can take up a considerable amount of time either before, during, or after the wedding. Georgia wedding planner Gail Johnson has had a wedding featured on Platinum Weddings. According to Johnson, the actual filming of a show like Platinum Wedding takes about five days, which is a long time to have cameras following you around. "Every event was coordinated, filmed, and re-filmed. Everyone was exahusted by the day of the wedding," says Johnson. Johnson also says that some of her clients have later regretted making their weddings quite so public. "I found some couples do regret the decision once they see the edited version, which is not always flattering or the fairytale they envision. There's also feedback on social media regarding the bride's hair, how much they spent, etc. The comments are not always positive, but it goes with the social media territory." Still want to make your wedding public? 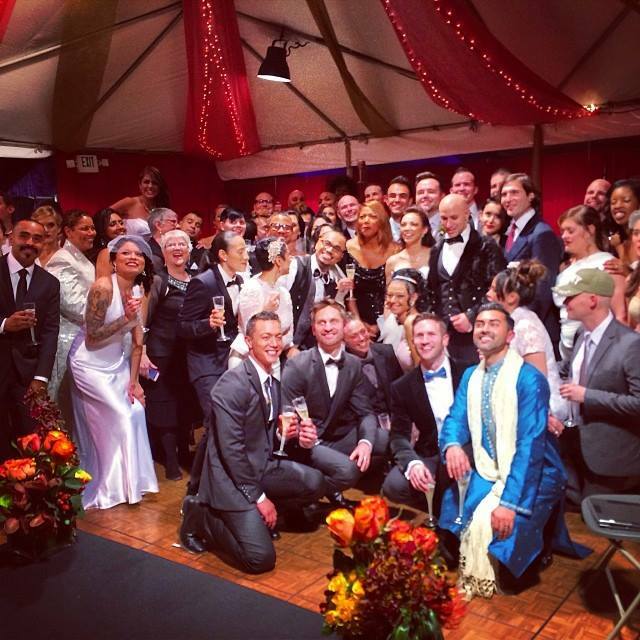 Johnson says she pitched her clients' unusual wedding to the show herself. Malone says that if you really want your wedding on TV there are some public casting calls, but your best bet is to find a planner you like who has a show. She cautions that even then there's no guarantee since production schedules can be unpredictable and the planner isn't the one in charge of deciding which shows are chosen. Malone issues one final caution, "Think carefully – do you think all the brides who were 'Bridezillas' knew they were going to be shown to be out of control monsters when they signed up for the first season? New shows can be tricky as you don’t know the spin – or the title!" Remember, all is fair in love ... and TV!